My words will MOTIVATE you, but my story will INSPIRE you! Jerod Ward is a TEDx & Keynote Speaker who has traveled the globe motivating and inspiring organizations on how to leverage their assets to deliver maximum results with a confident and competitive edge. Like most of us, Jerod discovered his talents by following and living his passions. A promising Star in the making, Jerod was hit with an avalanche of adversity that should have taken him out of the game. And yet he was able to achieve success beyond his dreams. Jerod reached the NBA, playing 14 years of professional basketball by tapping into the Power of Leveraging. Learn how to effectively leverage your assets on the journey to success and take your organization to the next level! For more information, please contact Jerod Ward on scheduling speaking event and fee rates. In today’s business market it is essential to have a clear yet innovative approach in order to gain success. Learn the principles to create a strategic plan to elevate your company to the next level. Every day we are faced with challenges and obstacles, it is our actions that will determine the outcome. Find out why adversity is a key ingredient and what actions to take in revolutionizing your business. “Victory is always possible for the person who refuses to stop fighting”- Napoleon Hill. Discover how to develop your personal and professional skills designed to lead to a Championship performance. 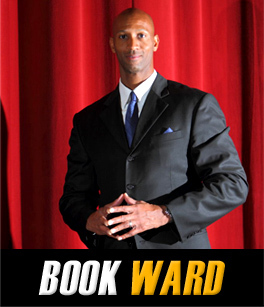 Jerod Ward is available for all kinds of personal appearances, including meet and greets, autograph signings, personal appearances for special events including a Q & A period. Jerod Ward also does many apperances for charities around his community. Jerod Ward Copyright © 2017 All rights reserved.